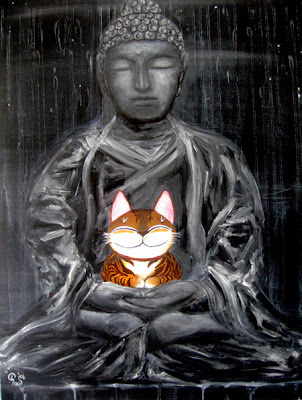 This is a big piece I did in 2005 for Catmasutra 2 measuring 29 x 40 inches - a cat that is larger than life!! While painting for the annual Catmasutra exhibition, each new painting will take its place on the walls, radiating its own blend of Catmasutra magic. Nearing the exhibition, I normally run out of walls to hang the paintings. Haha - it's simply wonderful when they're all up! The whole place will come alive and you can't help but be cheered by the wide grins and the irrepressible nature of these "cats". Sometimes Halo and Angel will be near the paintings and it's quite surreal - haha! I really enjoyed that period, and would be sad when I have to transport them to the gallery. It would be quiet again. "Portrait of a cat" is also in the postcard book. So I have this postcard framed up and sometimes I would wake up to its wide grin. Hmm it'll then remind me of how I should treat each day (kinda like a personal smiling buddha of sorts). I think we take many things for granted and with each passing day, we may lose something precious if we're not careful. It's 3 am and I'm writing this entry and listening to the theme song from Pan's Labyrinth. It's a cool movie distorting the line between reality, fantasy and imagination. What's real? What's not? How do we know the difference? Do we want to know the reason? haha I really should be zzzzzzzzZZZZZZ. Cat's sutra – a life state -; Felt good to do a bigger piece like this where I can apply the broader strokes more freely, a freeform signature almost. Completed this piece in Dec 2006 where if you remember, it rained like crazy. Hmm… I have always been fascinated by the rain, probably because I used to watch the rain together with my cat in the yard. It’s an old terrace house in Serangoon Gardens that my grandmother and father bought, with a covered but open-air kitchen. This led out to the yard where we had a two-seater swing and bamboo poles to hang out the laundry. My dad once dug out a small garden, and planted papaya trees, but closed it up soon after. “Man builds, man destroys” Haha – a quote from my dad. When the rain came pelting down, we would either play in the rain, drop paper boats into the longang (monsoon drain), or stay indoors; If I was lucky, my cat would be in the kitchen yard as well, watching the rain. "Vampire Days - Nine Lives", one of two pieces left from 2006 Catmasutra III Art exhibition, departs significantly from the rest of the collection. First of all, there're no cats (Haha) except for what the title implies. Inspired by one of my favorite movies "Interview with the Vampire", this smaller painting measuring 18 by 18 inches is a rare "mood" piece depicting the dark places we sometimes find ourselves in. Anne Rice breathed new life into the archetypal vampire myth, exploring the condition of immortality and the reality of death in varying nuances. “Nine lives” a common folklore of cats alludes to the cycles of a lifetime, how when one dies another begins. Transformation is another key theme in this painting akin to the rapture and awakening of a vampire. The “vampire tooth” shows this transformation and struggle to find the beginning of a new cycle (also based on the likeness of my Russian blue cat and its vampire-looking tooth sticking out from one corner of his mouth, and not to mention its insatiable appetite for anything you might be eating in his presence!). Haha - a good friend of mine also has vampire teeth sticking out of the corners of her mouth! Here’s to the end of everything bad in 2006 and the beginning of promise in 2007. These are two of the few remaining pieces from the 2005 Catmasutra art exhibition - "Dancers" and "Core of apple". The former is still at utterly Art but I'm hanging "Core of apple" at my office for now. Haha. Dancers is actually a "slimming Asian version" of Fernando Botero's "The Dancers".With all the slimming ads floating around (especially those miraculous ones where fat people are transformed into slim ones), the slim version of us is always lurking somewhere in our subconscious... So it was then in the true nature of Catmasutra that the cat is frolicking and growing fat while the couple is reduced in size appropriately! As the night trickles on, the scene exudes a magical quality where everything is stripped down to its core elements - a satisfying relationship between the dancers, the cat and the setting! Also the wooden flooring reminded me of the pubs in shophouses at Paranakan Place or MS where we throw everything on the floor, cigarettes, peanuts... Haha... except nowadays, you can't smoke unless you are standing in some sort of a yellow parking lot! "Core of Apple" is a catmasutra take on Rene Magritte's "Son of Man". In the catmasutra version, the cat has eaten the forbidden apple and the man finally shows his face (albeit a happy manga-looking face). Haha No need to hide behind the root of all sins - it's just an apple for heaven's sake! It seems there are no longer any easy illusions in this day and age. No more 'highs' of the sixties or a genuine belief in anything. Days of celebrations has become causes for terror (like the bombing incidents in Bangkok on New Year's Day). Everybody is so angry these days. With the smirk on his face, and the trademark grin on the cat's - maybe this is the perfect way to approach the new year... Live and let live! Thanks to all who loved and supported the latest Catmasutra (III) painting exhibition which recently concluded on Christmas eve 2006.